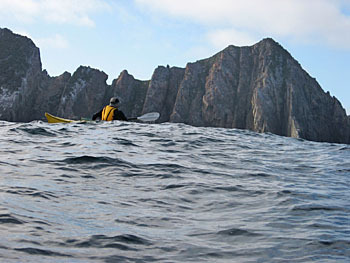 During the last two weeks of February the four of us paddled nearly 300km from Macquarie Heads to Cockle Creek along the South West Tassie coast. There were no roads between our start and finish point, and no people save a few fishermen and some South Coast walkers on the last stretch. This was a fabulous trip, and although words and pictures could never do it justice, here are some of the highs and lows. 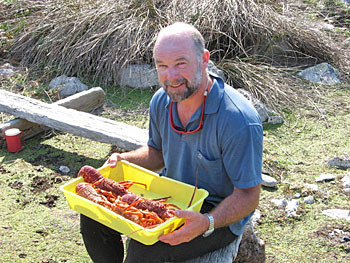 I got the call a few months before, Larry Gray had 3 friends from Victoria doing the trip and they needed another body. I was into it and started training hard the same day. I stopped when I heard how old they all were. The first question Rob asked me was “What sort of coffee do you drink?” Not having touched the muck for 20 years (and not knowing there was more than one type), I was a bit concerned about joining team latte. As it turned out, they were the best lot I could have hoped for, all of them strong paddlers, good blokes and with two of them having done the trip before. They did have some curious habits though. We met late in the day in Melbourne and hopped on the Spirit of Tassie for an excellent crossing overnight. We arrived at 0600 at Devonport then shot down to Strahan in about 4 hours in Cam’s Patrol with 2 boats on top and 2 on a small boat trailer. Very warm day for Tassie, the locals were beside themselves at the balmy conditions. Last minute shopping/calls/lunch then 12 km or so along dirt road to Macquarie Heads campsite. Drove straight to waters edge to pack up. I was relieved my boat was in one piece, having shipped it from Newcastle and not unwrapped it. My boat was heaviest by far, and remained so throughout. I eventually realised previous repairs had increased the boats’ weight considerably. 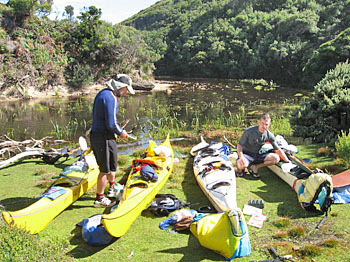 After packing I rolled a few times for fun in the clear warm water of Macquarie Harbour. Eventually we set off, all of us obviously glad to be going after all the prep and travel. Still conditions in the harbour, paddled out past Entrance Island where interesting whirlpools were seen in the water due to mingling of currents. 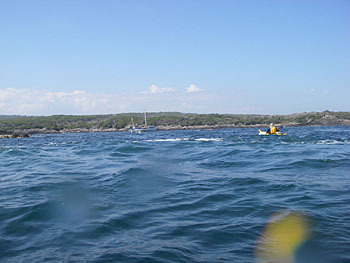 Rounded Cape Sorell into light Northerlies and beautiful conditions. 0600 awake as every day on trip. Porridge/tea/pack up then off at 0740(got quicker every day, under one hour pack up by end of week). Flew down coast with 20+ knot following wind plus chop. Two hours to Varna Bay then another two to Hibbs Lagoon. 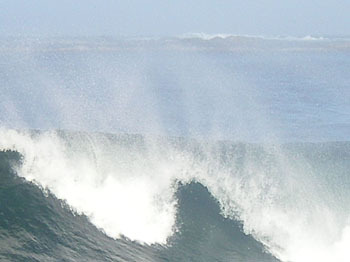 Small surf at Hibbs (under 1m), apart from the large wave that hit me when I was daydreaming. Despite all my solo rolling practice in rough offshore conditions I got spooked and bailed out, to my great annoyance (and the others evident enjoyment). Great campsite at Hibbs, 200m upstream from beach. Flat grass, table, fresh water. Had an early mark and set up camp, easy afternoon fishing/exploring lagoon then another excellent tea prepared by Rob and Mick(as they did every night).We watched Southerly change come in then heavy rain about 1800, forcing retreat to tents. Weather changes very quickly in this area. 28km, 4 hours. Surf up but looked ok. Pack up then down to beach. 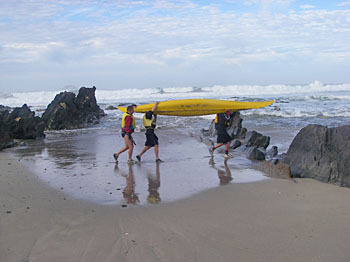 Surf bigger on close inspection, up to 3m and breaking hard along whole beach in an unpredictable way, three rows of waves deep. Had a closer look in boats and felt fierce rip pulling us to end of beach and trying to push us out into waves crashing on rocks. Would be very dangerous if we came out of boats. Decided rest day was in order. Surf down a little today but not much. Cam had walked whole length of beach the day before and found a spot with only one line of breaking waves, so portage was in order-over 1km with each boat. 2 hours later we were ready to head off from beach. Cam and Mick got off ok, then I held Rob and pushed him off. He got pounded the first time but got out the second time. I had stupidly volunteered to go last and was readying myself when Mick turned up to help. 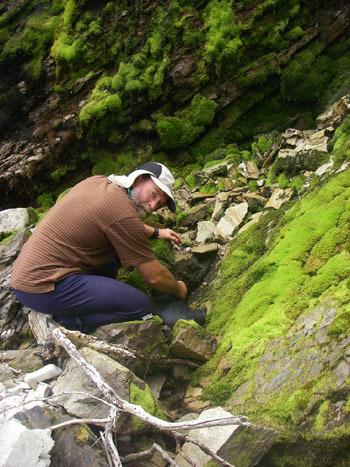 He had landed a long way along the beach in a protected rock gully. I was very touched he went to the trouble to help instead of watching with keen interest as I would have done. Once out we all pushed on for the next headland of Point Hibbs. Swell about 3m, 15-20 knot headwind (headwinds a feature from this point on!) Slow progress around corner to Spero River, looked closed out initially then up close it revealed a flat calm entry, sheltered behind small rock outcrop. Beautiful flat campsite beside wide river. Rob got 4 salmon, me none. Mick found large seal skull complete with incisors, and showed me local edible plants including pig face, with its peppery taste. Both Cam and Mick were very knowledgeable about botany and were frequently to be heard debating/arguing which genus and species were correct for a bush or tree. Excellent tea of potato rosti. We were all a little concerned about our slow progress and decided to push for Mainwaring Inlet in the morning. 28 km for day, 4.5 hours. Early start, hard push to Montgomery Rocks with company of gannets, mutton birds, albatross and dolphins. Wind rose over morning to 20 knots, SW swell 3-4m. My elbow painful with epicondylitis, the other 3 a bit achy as well. 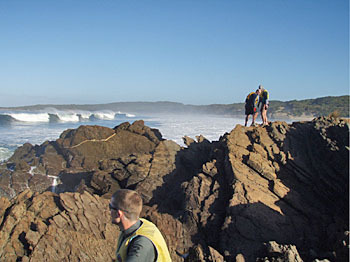 Past High Rocky Point, large bommies with serious dumping waves along whole shore. Crept on into strengthening wind after rafting up and chewing down some calories. 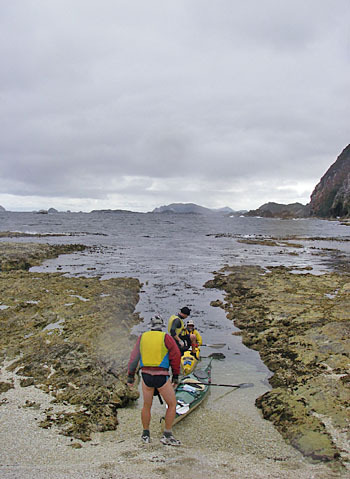 We were quite exposed at this point with our only landing options being Mainwaring, then past Low Rocky Point or Nye Bay(40 km on!). We were tiring and finding it difficult to place our position accurately on the map. We had to stay well out to sea to avoid bommies and twice mistook inlets for Mainwaring. We were resigned to the fact that Mainwaring was closed out and would have to push on to Low Rocky Point when Rob spotted a mast off to our SE. Lucky he did as it was a fishing boat moored in Mainwaring Inlet. As we crept into the inlet the large swell and rebound died completely, as did the wind. It was flat calm in there within 30m of the entrance, a truly amazing change. As soon as we relaxed we felt a great lethargy come over us, and it was a real drag to paddle the km or so up to the campsite. Relaxed rest of day, thinking on the experience of not being entirely in control of ones’ own progress, instead having to adapt to the local conditions of wind and swell. Also marvelled at the Victorians’ trick of peeing over the edge of the boat like a fountain. I tried this but obviously my equipment was not up to scratch as all I got was a wet leg. I think we were all pleased with our efforts today, and starting to feel much fitter.35km, 5.5 hours. Beautiful morning in our protected campsite. Out of inlet head on into 20-25knot headwinds and wind chop. 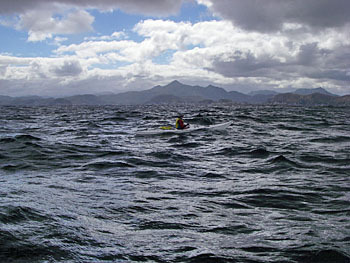 Painfully slow progress, strengthening wind, being blown back immediately paddling stopped. Mentally hard for me the first hour, falling behind. We met up after the first hour and decided to carry on. I felt much better and stronger once decision made and we all pushed on. Solid paddling, all of us anxious about finding suitable landing. En route we got weather report from fishing boat “Tora”, with the fishoes seeming surprised to see us in those conditions. Forecast for wind to drop. Nice blokes, gave us 4 crays for tea. We carried on, visited several times by albatross who obviously couldn’t believe how slow we were. 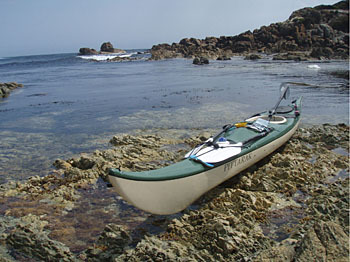 After 4 hours we headed for an inlet on the North side of Low Rocky Point. Had lunch, wind stayed up so took early mark. We all realised the pointlessness of tiring ourselves with forecast for weather to improve. Talking to the others, they all had low points during the day at various times but we all found the apparent strength of the others encouraged us to keep plugging on. Nice campsite on level ground with beautiful views and deep rocky cove for snorkelling. Enormous strands of seaweed, more than 10m long, with fish galore. We were low on water so walked up past lighthouse and onto heathland looking for water. Found some after 40 mins walk or so. Whitecaps very obvious on South side of point, good decision to stay put after lunch. Cooked and ate crays for tea, fantastic with plain rice/soy sauce, then pancakes.12km, 4.5 hours. Fine day, minimal headwind and flat sea. I had at least 50 sea lice in my cockpit (climbed in overnight from my wetsuit). Got most, but picked 17 off my legs over day. Good progress, all of us feeling fit by now and grateful for decent conditions. Met some surly fishermen en route, no useful info forthcoming, but did get an ab with a cracked shell off one of them. Nice views, and visits from albatrosses, gannets, penguins, terns and dolphins. Pulled into South East Bight after 8 hours. 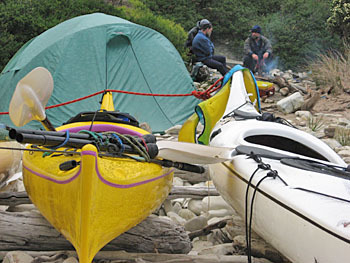 No good campsites, but good location to avoid being trapped by predicted larger swell. We all got soaked getting fresh water on exposed beach due to nasty shore dump, then camped right under lee of North Head. We realised 4 was a good number for the trip as we could all help with carrying boats over sharp slippy rocks, and wouldn’t drop boat if one person slipped(which happened constantly). 50km, 8 hours. Very comfy sleep on large pebbles on beach. Up and out on water, SW wind 10 knots. Decided on short day as we knew a few possibly hard days were approaching. 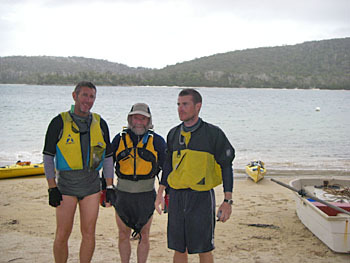 2 hour crossing across Port Davey to Norman Cove, where on their last trip Rob and Mick spent 2 days in a smoky cave due to shocking weather. Nice bay, sand and pebbles. Fresh water on beach. Went walking, found old chair which was great to sit on after using rocks for so long. Also lots of pumice stone on beach, obviously from volcanic origin, as well as old seashell midden. Rob and Mick went up the hill but didn’t fetch a pail of water. They did however find an old tepee in the bush where someone had obviously lived a while ago. Visited several times by a little whip snake. Cold night. Luckily Rob and Mick thought to put the fire upwind of my tent so Cam and I could keep warm by coughing. 14km, 2 hours. Up early, very windy so back to bed. Went up hill after brekky to check out view over Port Davey. Could also see down coast to SW Cape. Wind dropping so set off to Island Bay, 10 km shy of SW Cape. Wind swung from SW to NW half way so good progress. The bay had a natural gap in the rocks allowing us an easy landing on the shingle. Otherwise there were flat rock platforms all along the narrow beach and a sheer cliff behind. This made the surf sound very loud and very close, as shown when Mick and Rob jumped out of their tent in the middle of that night and blundered around the beach shouting that we were “sinking”. The waves were only 15cm high at this point! Had a look around the rest of the day, found water in next bay (identified from distance by moss on rocks) and followed my nose to dead seal. Body was rotting but skull pretty clean so pulled it off. For rest of journey it lived on my deck in some old fishing net as it was too smelly to go inside. (My dog tried to skulk off with it when I got home and I had to grab it back, minus one cheekbone).18km, 2 hours. Follow the green sign to water! Quick pack up and off to SW Cape. Over 2 hours for 10 km to cape (adverse currents?). All of us flat and lethargic initially, but picked up. Lots of wildlife. Large swell today, up to 5m, around cape enormous breaking waves and flocks of gannets plunging into sea to feed. Important landmark, as once turn made around cape the prevailing swell moves behind the boats. 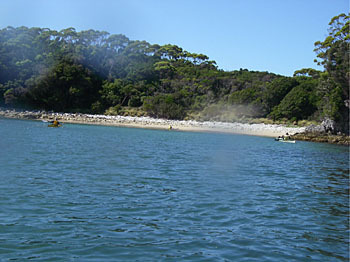 Another 10 km to Ketchum Island for lunch, to beautiful hidden bay on North side. Saw our first walkers on Ketchum Beach but surf too big to say hello. 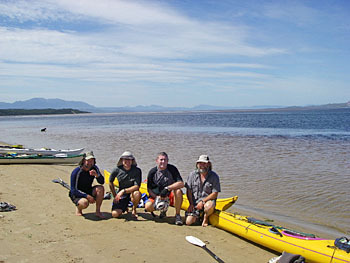 Continued on after lunch, 20km in under 3 hours to land on nice sandy beach at Anchorage Cove. Tucked right into SW corner to avoid any large swell in morning. Unusually, Mick didn’t get rolled over on way in. Nice fresh lagoon for a wash. All of the others had a fascination for washing (something regarded as effete by the hardy NSW paddlers), and I have to admit it was pleasant to wash the salt and lotion off. Mick brought his solar shower, which was a great idea. We were all feeling strong now, but a little anxious about the last stage of the trip due to its long exposed stretches and few safe landing spots. 40km, 6.5hours. 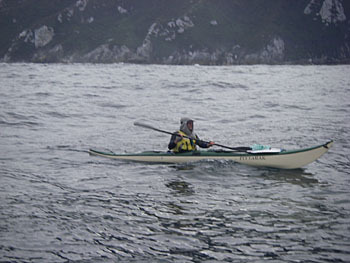 Set off in calm conditions, good progress to Deadman’s Bay for break at 10am. 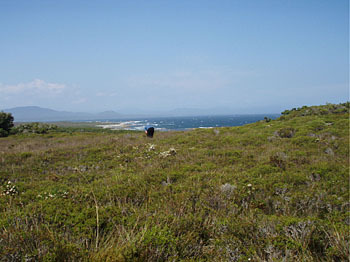 Met several walkers on South Coast Track, as there was an official campsite there. Set off at 11am, with aim of reaching South Coast Rivulet. Within ten minutes, though, the headwind started to build. Pushed on for 2 hours, less than 10km gained. Looked at landing on Eastern end of Prion Beach (waves pounding in like a juggernaut) and also Rocky Beach Inlet (death trap).We had no water so couldn’t land on islands. So, much to our disgust we turned around for Deadman’s again. Flew back 10km in 70 minutes due to following conditions but even this didn’t cheer our mood. Decided to rest up and push on early tomorrow for Cockle Creek, before wind came up. Running out of food. 40km total, 16km made good, 7 hours. Rob checked conditions at 0400. Conditions were difficult to judge from our protected campsite but there seemed to be a headwind. We should have packed and gone offshore to check but we didn’t as our sleeping bags were too warm. No change later in morning but decided to push on for Cockle Creek anyway. Left at 0900, good conditions initially, 20km before headwind hit at 1130. The NE wind came up just before South Cape, with progress painfully slow to cape with 20+ knot gusts, clapotis and wind chop rapidly rising. 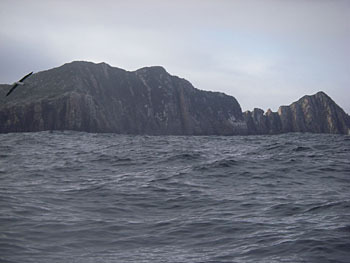 Wind was howling as we passed cape, being funnelled along steep cliffs into our faces. 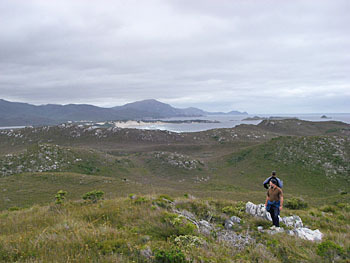 South East Cape came into view, 10km away. Psychologically hard to see next landmark so far ahead, but I focussed on making each paddle stroke really count and used shore landmarks to measure progress. We were driven backwards if we stopped so no pee stops, for first time ever I went in boat. Snatched chocolate for food. Unfortunately no time for photos. As we crept further from South Cape the wind moderated a little to only 20 knots or so, only to strengthen again as we closed on South East Cape. At the back of our minds was that there were no safe landings before South Coast Rivulet, and we were pretty sure that would be closed out, and likely we would be shorebound if we did get ashore as swell was rising. 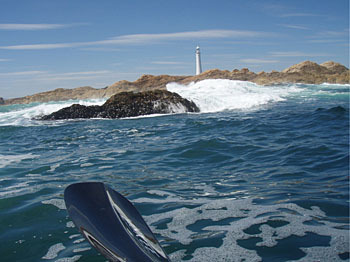 In reality we had to get around Whale Head to get a safe landing, about 6km past SE Cape. If we couldn’t manage that, we would be going all the way back to Deadman’s. We were slowing but determined and Whale Head came into view. More funnelled headwinds as we crawled past into moderating conditions. Finally paddled past safe landing sites at Trumpeter Bay. At this point suddenly all our aches, pains and discomforts started to niggle. Slow progress up the coast, finally turned past Navigation Light at Cockle Creek entrance. 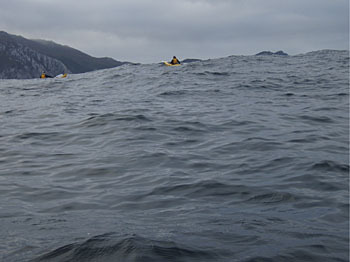 Had a small following swell as we entered and we all enjoyed being pushed along by it. 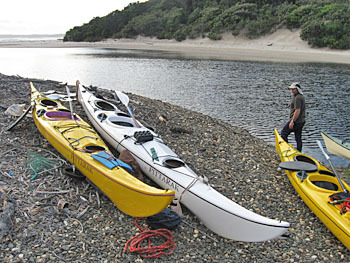 Pulled into a small sandy bay at a “campsite”. Rob and I had a swim and swilled out the cockpits of our boats for obvious reasons. We found out it was actually private property, but the owners were tops, letting us camp on the grass and firing up the outdoor shower for us. Our last meal (literally) was packet curry, very nice after eating snacks only during day. Surprisingly we were not that tired after day, and I slept poorly, thinking about getting back to real life.47km, 8.5 hours. Pack up in wet weather. All food gone after brekky save some tuna. 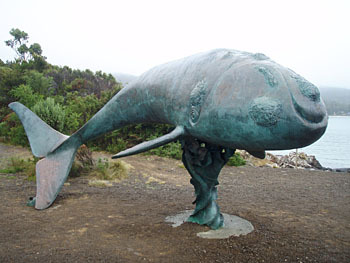 Looked around Cockle Creek, very interesting little place with Southernmost street in Australia and memorials to whaling and logging heritage. Cam and Mick’s cousin arrived with car and we set off to Hobart (via schnitzel and beers at pub) for a visit before back to Melbourne and splitting up for home. This was certainly the most enjoyable and challenging trip I have been on. I was lucky to have the previous experience of Mick and Rob to learn from, and would advise anyone going on this trip to seek such advice before you leave. We had campfires most nights so lots of fuel is not necessary, and water was plentiful. 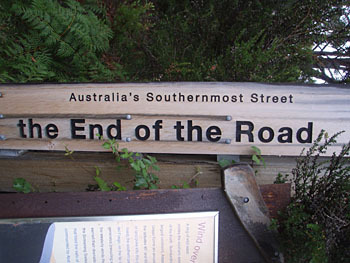 We were glad we spread the trip out as we did as the tendency is to race through and miss a lot of nice country. I’ll be heading back for sure.